Wigan Warriors have had the points reinstated following their appeal against the punishment for breaking the salary cap. Warriors appealed the decision to dock them two competition points for breaking the salary cap in 2017. After a hearing yesterday, the fresh panel has delivered its verdict - and imposed a two-point deduction but which is suspended for a period of 12 months, until March 2020. That deduction will automatically be activated if Wigan commit a further breach of the Finite Salary Cap in that period. In addition, the panel has ordered Wigan to pay a fine of £5,000 immediately and confirmed that costs of £2,000 for the original hearing on January 24 must be paid. The panel have also ruled that their appeal deposit should be retained by the RFL. The RFL and Wigan had already agreed to split the cost of the Sport Resolutions hearing. 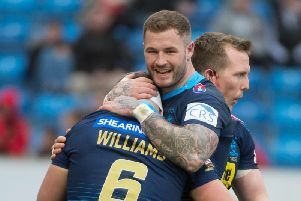 By cancelling the points deduction, Wigan are now off the mark, with the two points - from beating Leeds in round two - seeing them leapfrog the Rhinos into 10th position. They host win-less Huddersfield on Friday in front of the Sky Sports cameras. Wigan Warriors Chairman and Owner, Ian Lenagan commented: “We are now able to draw a line under this issue and are pleased that the Sports Resolutions independent panel have reached what we have always believed to be the correct decision. “Throughout this process we have acknowledged the administrative errors that resulted in this technical breach and I’d like to say again that we apologise unreservedly for the errors and accept a fine of this level is justified. At no point during this investigation has Wigan’s integrity been questioned. Our main argument has been that a points-deduction punishment was disproportionate to the marginal nature of the offence committed and we are happy that the independent panel shares this view with today’s decision."